At this time of year before harvest, terraced fields in Mu Cang Chai district, northwestern Yen Bai province look most beautiful in the yellow colour of ripening rice. 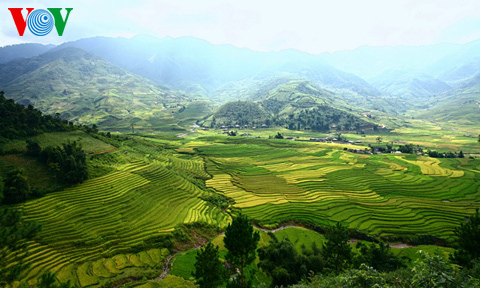 With its picturesque feature, Mu Cang Chai was recognized as a national scenery heritage site in 2007 by the Ministry of Culture, Sports and Tourism. A week called “Mu Cang Chai terraced fields, national scenery, culture, sports and tourism 2013” will be launched on September 26.